Welcome to Tottori Allergy & Asthma Associates, where caring is our business. 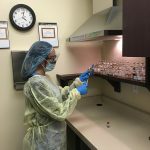 We are Southern Nevada’s most recognized leading experts dealing with allergic, asthma and immunologic conditions for adult and pediatric patients. Listed below you will find some of the services we offer. If you should have any questions regarding a specific service, please feel free to contact our office. We look forward to helping you. Prick skin testing, also known as scratch testing, is one type of allergy testing. A small disposable prick device applies the allergy extract to the skin and then scratches or pricks the skin. Intradermal testing is also used for testing, which involves injecting the allergy extract under the skin. Common allergy extracts are grasses, weeds, trees, animals, and molds. A hive or raised bump will occur at the site of the prick. Each test site will be measured and specific allergies of the patient identified. Prick testing may be applied to the forearms or the back depending upon the age of the patient, the number of tests ordered, and the condition of the skin. Immunotherapy (allergy shots) is a treatment of allergy to airborne allergens. It involves administering gradually increasing doses of allergens which cause the immune system to become less sensitive to the allergens. Allergy shots are effective for allergies to grass, weeds, tree pollens, molds and animal dander. Avoidance is the first line of treatment for animal related allergies. Avoidance of allergic triggers and use of medications are major components of allergy management. Allergy shots are not a cure, however symptoms may be minimized through a long-term commitment by the patient. Medications should be continued in conjunction with allergy shots and improvement may be seen as early as 6 months. Factors that determine the need for allergy injections include: patient history, skin test reaction, and significance of the allergen to the geographical area. Allergy shots are 80-85% beneficial and require regular attendance for effective response. Pulmonary function tests (PFTs) are noninvasive diagnostic tests that provide measurable feedback about the function of the lungs. By assessing lung volumes, capacities, rates of flow, and gas exchange, PFTs provide information that, when evaluated by your doctor, can help diagnosis certain lung disorders. Food testing may be initially performed by scratch skin testing. If indicated, a graduated oral food challenge over a few hours can be performed in the medically safe environment of the office. Another type of testing known as a RAST or Immunocap testing involves examining specific IgE in the blood. Venom testing checks for allergy to a group of insects known as hymenoptera. Testing to honey bee, wasp, yellow jacket, yellow hornet, white hornet and fire ant is available. Testing involves both scratch testing and intradermal testing. Venom immunotherapy (desensitization) is available to patients with positive test results who have a history of potential life threatening reactions to bee stings. Testing for vaccine is available. Testing begins with a scratch test of a weakened dilution of the vaccine. Intradermals are the next level of testing. Depending on the results, vaccines may be administered with patients monitored for several hours or desensitization may be suggested. Testing for drug allergies, such as antibiotics, is available. Commonly tested antibiotics are penicillins. Testing begins with a scratch test of a weakened dilution of the drug. Intradermals are the next level of testing. If skin testing is negative a final part of the testing in the office is a graduated oral challenge to the medication. Patients with negative results to the test drug will then be instructed on how to complete the rest of the challenge. Testing for medication allergies is available. Commonly tested medications are local anesthetics. Testing begins with a scratch test of a weakened dilution of the medication. Intradermals are the next level of testing, depending on the results sub cutaneous injection may be required.